Interested in Joining the The St Brigids GAA History Committee?? In 2011, the club formed a history committee to go back right through the years and reveal some great facts & photos from the club's past. The photo above of the old St Brigids clubhouse which used to stand where the new hurling wall is now is a great example of some of the great gems from the past. The photo was collected by the Club History Committee who are looking for more old documents and photos from our club members. In 1973 the present grounds of 11 acres were purchased and renamed Russell Park. The current club complex was opened in 1988 and comprises of a sports hall, dressing rooms, handball alleys and viewing area, meeting room, GPO Office, Gym and members lounge. Our achievements on the football and hurling scene include 6 Under 16 football championships and two A Minor football championship wins in 95 and 2007, Dublin winners of Feile na nGael on numerous occasions and levels including (Under 14 A hurling 1999 and All Ireland A Hurling and Football in 2012) and numerous titles at under age level in both hurling and football. At adult level the Club has gone from strength to strength, building on the success of the Juvenile section. The elusive U21 A Football Championship was captured for the first time in 1998 and the Junior footballers won the inaugural Leinster Junior Club football tournament in 1996, winning the title again in 2010. Our Senior Football team has won Division 1 County Senior Football League on three occasions in 1999, 2005 and 2013 and were runners up in the County finals of '99 and 2001 and 2010 and winners in 2003 and 2011. 2003 also saw our Senior Footballers win the Leinster Senior title, while narrowly losing the 2011 final. In 2000/2001 and 2009 the Senior Hurlers won Division 2 of the Senior League, gaining promotion to Division 1 Status. 2009 also saw our Senior Hurlers claim the Senior B Championship title. In 2010, our Intermediate Footballers claimed the Dublin Intermediate championship title for the fifth time, a county record after wins in 1958, 1980, 1992, 2005 and 2010. 2010 also saw our Junior A Footballers win the Dublin Junior Championship for the second time in the clubs history after victory in 1996. The modern members Lounge at Russell Park was officially opened by An Taoiseach Mr. Bertie Ahern T.D. on February 1st. 2002. After much digging and researching the clubs history committee have compiled a full list of the clubs past chairman, secretaries and presidents since the clubs foundation over 80 years ago in 1932. To mark the 80th anniversary of the club, these dedicated men and women where celebrated at a special ceremony in November 2012! Photo below, with more to follow. If you would like to become involved in the clubs history committee, please email info@stbrigidsgaa.com. 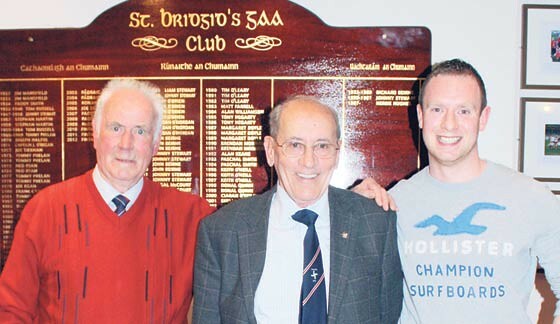 Club President Herbie Hughes, Former Club Chairman and Secretary Tommy Phelan and Researcher Stephen Moore celebrate St Brigids 80th Anniversary in November, 2012.